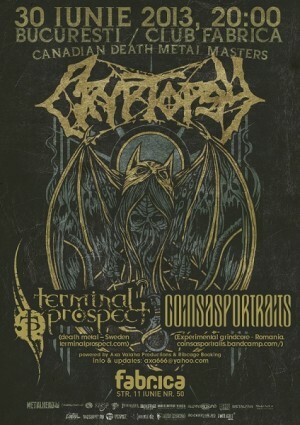 "CRYPTOPSY (Canada) / TERMINAL PROSPECT (Sweden) / Coins as Portraits (RO) " Concert in Bucharest. You can get here description, reviews, address, time and details of "CRYPTOPSY (Canada) / TERMINAL PROSPECT (Sweden) / Coins as Portraits (RO) " Concert in Bucharest. Visit Bucharest Tips for more Concert events in Bucharest!